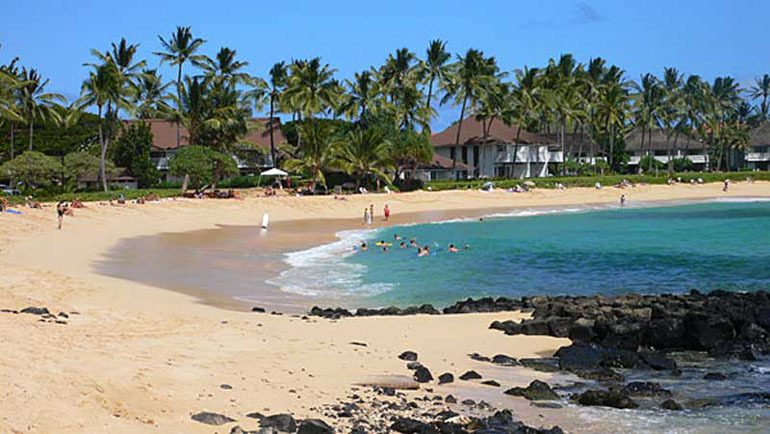 Beach number one with wheelchair accessibility: Poipu Beach Park has a Landeeze all-terrain wheelchair. Park across the street – there are two permit spots. There’s a paved walk up to the beach (but not to the lifeguard station). There are accessible restrooms. Get your buddy to go to the lifeguard station and ask for the beach chair. At this point you have 2 choices – you can get into the beach chair and get your buddy to push you over the grass/sand closer to the water, then go back and get your regular chair; or you can tough it out in your regular chair as close as possible. It’s easier to get into the water from the left (east) side of the cove – the slope is gentler. It’s the side where the babies are. Once in the beach chair, your buddy can pretty easily push you down and into the water until you can sort of float off. The water is very shallow and the bottom is rocks, so reef shoes and/or gloves are a good idea. Getting back out again is a whole ‘nother adventure. The beach chair floats when no one is in it, making it pretty hard to get back into. And big balloon tires don’t negate gravity when your buddy is trying to haul you and the chair up the sand. We later discovered that the lifeguards would have been happy to help, either by sinking the chair or by lifting me back into it. They also were happy to run me through their cold water shower to rinse off some of the sand and salt before I transferred back into my chair. The lifeguards are knowledgeable and helpful – apparently there are a few folks who use the beach chair regularly, so they’re used to it.